...this little girl is in her room NOT taking a nap. I know because I can hear her playing. But now that she is in a "big girl bed" (which yes, is just her crib mattress on the floor, don't judge) I try to let her just have "quiet time." She will be asleep 1/2 an hour before it is time to wake her up. ...I am in the middle of making a cake. It's actually turning out to be kind of an epic cake. I'm okay with that because it is the cake intended to christen the kitchen. I'll tell you all about it once it's done. I've burned the caramel sauce that goes on it twice. TWICE. ...these curtains arrived in the mail today. I love them. ...my in-laws are coming in two days! We're excited to see them and I'm happy for the motivation to get the house a little bit more in shape. ...I've been thinking about our little family of three a lot lately. I think we're going to have a good year. ...I'm feeling the need to do a bit more Living Life rather than Narrating Life so my posting here will be slim at best for a couple of weeks. I hope you understand. I'll still pop in on Fridays to share the menu! ...Tomorrow is the 12th. Are you going to play along this year? Pretty please? I really love those curtains too. Have a great visit with family. Love ya, and completely understand the need to live life,,,,fully, for a while. I am feeling it too. 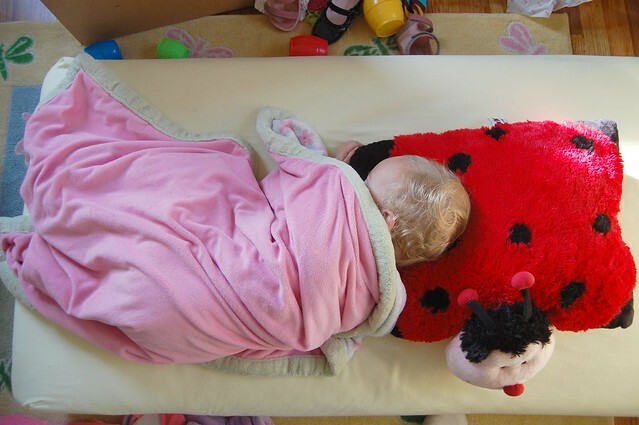 I LOVE the ladybug pillow pet! I wish Santa brought me one! :) Just wanted to tell you that my camera is charging as I comment here...So that I may participate in the 12 on the 12 tomorrow. I'm excited about it and I'm thankful for you and Gretchen's inspiration. AWESOME!!! I will really try to play this year with the 12 on 12th... I wasn't as good as I wanted to be this year - resolution! I love the idea of you christening your kitchen. And living life. Your baby girl is adorable! i love it, pillow pet and all! Have fun living life!! My son is currently sleeping on a crib mattress on the floor as well. I think it is a great idea. She got her pillow pet! Such a little cutie curled up like that, with her longed for Christmas pressie too! Will love catching up with you Miranda when you have a quiet moment but living life is so very important - enjoy. PS: 12 on the 12th was another day doing nothing - I really must book in the most exciting day soon! Seriously love the curtains. I think I already said that. Can't wait to hear about this cake... caramel sauce? Oooh boy, this is gonna be good. Thanks for the invite to participate in the 12 on the 12th... I had lots of fun doing it yesterday. p.s. SO glad Z got her pillow pet!